Dow is currently up 330 points. I went long earlier this morning, got stopped, and went long again just over 900 on this last ramp job. 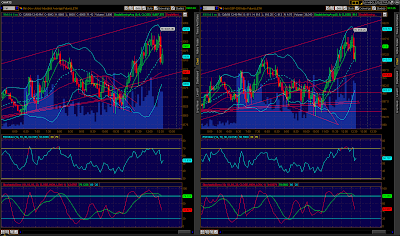 We are approaching overbought on all stochastic indicators 60 minutes and under on both the fast and the slow. I am going to pull down my longs prior to the close, but will not go short here due to the symmetry I pointed out earlier between this wave up ‘c’ and wave ‘a’ up. They are nearly identical, with wave ‘c’ being about 90% as strong as ‘a’ so far. Thus I expect this rally to run into Thursday time wise and should target about 9,400 plus on the DOW. Again, if symmetry holds, I expect a pullback going into the close and then again most likely in the morning tomorrow, followed a resumption of the rally later tomorrow. I am cautious about this, however, and at the first sign of breaking that symmetry will re-evaluate.